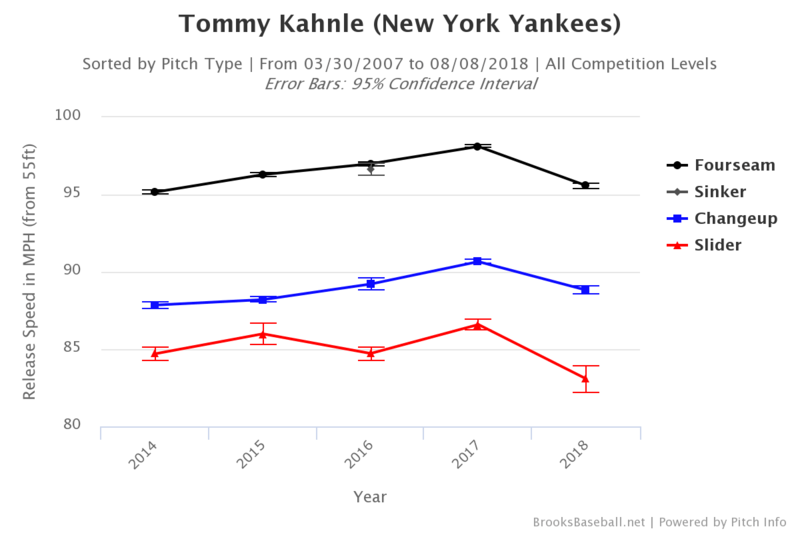 This past weekend, as part of what had become a daily bullpen shuttle, the Yankees called up Tommy Kahnle for exactly one day. He replaced Luis Cessa, who pitched in long relief Thursday night, then he was sent down for Chance Adams, who started Saturday. Kahnle faced three batters Friday night, recording a strikeout, a ground out, and a fly out. As routine as low-leverage relief appearances get. The Yankees sent Kahnle to Triple-A earlier this season — it was a surprising move at the time — because he’d been ineffective, because his velocity was down, and because Jonathan Holder had pitched so well the Yankees had no choice but to keep him. In 22 Triple-A innings Kahnle has a 4.09 ERA (3.04 FIP) with 33.7% strikeouts and 9.8% walks. His Triple-A swing-and-miss rate (13.7%) is lower than his big league swing-and-miss rate last year (16.7%). Never before had Kahnle thrown as hard as he did last season and it’s possible he may never throw that hard again. At the same time, a fastball that averages 95 mph and touches 97 mph should be plenty good enough to get outs at the big league level. “(I’m) frustrated, especially because I’m not throwing as hard as I was last year and that’s the determining factor for them at this point,” said Kahnle to Lindsey Adler (subs. req’d) recently. When the Yankees called Kahnle up over the weekend, it was because they needed another reliever, not because they wanted Kahnle specifically. Adam Warren, Chasen Shreve, and Gio Gallegos had all been traded away, ditto Cody Carroll, the team’s most MLB ready bullpen prospect. Kahnle was the only option, realistically. Aaron Boone even admitted the Yankees explored trade options before calling him up. Not exactly a ringing endorsement! Right now the Yankees are essentially in a holding pattern with Kahnle. If they have to call him up, they’ll call him up, otherwise their actions indicate they don’t consider the current version of Kahnle to be a viable big league option, or at least not a high-end option. Gallegos was called up ahead of him several times this season, remember. 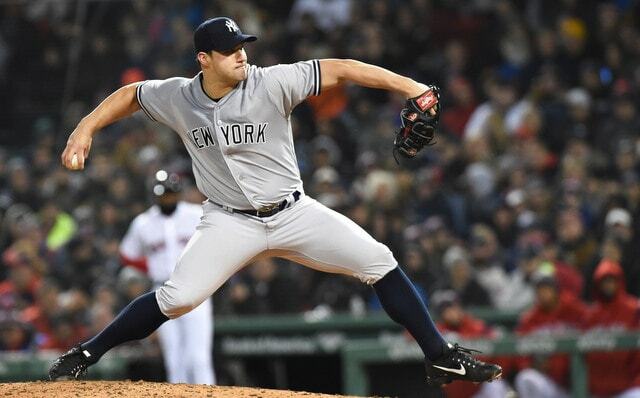 So Kahnle remains in Triple-A with both he and the Yankees hoping his velocity returns even though it hasn’t yet. I am not at all optimistic Kahnle’s velocity will return this season. It is August now and he’s been pitching regularly for months. If the arm strength isn’t there now, it’s probably not coming. Hopefully the offseason allows him to reboot, rest up, and get back to where he was last year. And, if it doesn’t, Kahnle should still get a chance to show he can be effective at this velocity. Mid-90s gas with his changeup should work. Kahnle will certainly be back as a September call-up in a few weeks and who knows, maybe he’ll show everyone he can be an effective reliever even with reduced velocity. The Yankees have to prioritize winning right now, not Kahnle, and that’s why he’s in Triple-A. They don’t think he can be effective at the moment. The fact he’s spent one (1) day on the MLB roster the last three months tells us that, especially after how well he pitched last year. It didn’t buy him much rope. What happens with Kahnle next season? Who knows. It is way way way too early to worry about that. This season the Yankees expected Kahnle to be an important part of their bullpen and it didn’t happen, and now he’s essentially caught in reliever limbo. Too good for Triple-A — seriously, what’s he learning down there? — but, in the eyes of the Yankees, apparently not good enough for the big leagues. Not a good place to be.